A square grid of geometric tiles, generating random seamless patterns. The Truchet tiles are displayed in a square 'pool' array. Each tile has either 2 or 4 alternative appearances, which are continuously displayed at random. The resulting patterns can appear quite complex. This sim uses a second stage for tile size and pattern selection controls. See Icons page	for	tiles. See Stage for random Truchet arrays. Click the upper arrows to change the number of tiles (4 to 256). Click one of the lower tiles to choose the pattern. 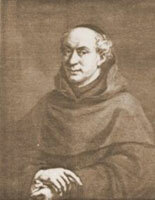 Sébastien Truchet was an eclectic monk born in 1729. He was a mathematician and designer who explored plane coverage using tileable elements. Truchet tiles have two different edges, left-right and top-bottom. When tiled in a chequer board layout, all tile edges will match and a seamless geometric pattern results.